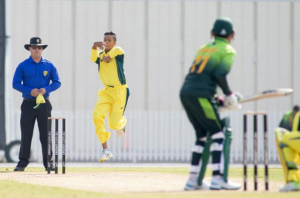 One to watch: young Ghosts bowler Tanveer Sangha in action for Australia against Pakistan last summer. A blend of youthful talent and solid first grade experience was the perfect mixture as the Ghosts defeated Blacktown in round five of NSW Premier Cricket on Saturday, reports JASON ELLSMORE. The Ghosts bowlers toiled well in restricting Blacktown to 8/231 in the first innings having sent the Warriors into bat for the morning session. All the Ghosts bowlers finished with wickets, however eyes were on debutant Tanveer Sangha. The 16 year old’s selection came on the back of a fine first grade T/20 debut the previous weekend in which he demoralised the Northern District bats taking 3 for 8. The Australian Under 16 representative who last summer bowled superbly in the Youth Series v Pakistan, finished with the respectable figures of 1/38 off his 10 overs against Blacktown. As the Ghosts bowlers shared the wickets, skipper Jarrad Burke’s figures of 2/32 from 10 overs were the pick. He then returned to his old opening batting position to join Aaron Yabsley in the afternoon. The two of them led the run chase that the Ghosts finally achieved in the 47th over. Burke went at a run a ball for his 38 runs putting on 62 with Yabsley (29 runs) before being caught at mid-wicket. Philip Wells played superbly before he was stumped for 46 with the Ghosts needing 90 with seven wickets in hand. Having shared a 67 run partnership with Wells, Englishman Ollie Robinson remained at the crease till the end of the innings. Robinson’s composure saw the Campbelltown Camden side cruise to victory having lost just five wickets. Robinson was impressive again for 77 unbeaten runs that included six boundaries. In a display of complete control, his intent to get the Ghosts across the line was evident right throughout his innings. Another handy 60 run partnership with Jordan Browne (20 runs) at the back of the innings put the Ghosts back on the M7 taking home the points. The Ghosts host Gordon next week in a vital two-day game between both teams on the same number of points on the ladder after five rounds.